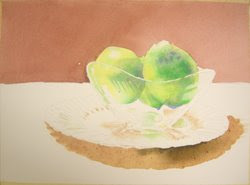 I want to begin to develop some of the shadow values in the lemons. 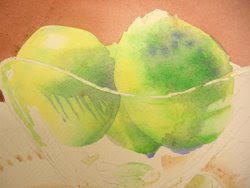 Using French Ultramarine Blue with a lot of water, I lay in some of the shadow shapes in the lemons. As this is drying I use a touch of Burnt Sienna here and there to warm up the shadows and deepen the values. Blue and red-brown (Burnt Sienna) are relative opposites on the color wheel. Using them mixed together or glazed wet-on-dry, will create warm, dark values of neutral color. Mixing French Ultramarine Blue and Burnt Sienna in a stronger mixture is one of my favorite blacks or dark browns. If you keep it transparent, the color just glows!